Welcome back and happy New Year. Today we are working on many things. The programming team is working on a CAD model, our build team is working on the level 2 platform for the robot to climb on and testing an idea we have for a ball/hatch gripper. We also had a blast at the kickoff event so that’s all for today. Hey guys we’re back and on this chilly December Tuesday night the flurb team is split in two. Half of our team is with one of our sponsors Henshaw working to construct this years new pit. The other half of our team is here in room 312 working on important things like swerve drive and vision. Swerve Drive allows for our robot to go around a whole 360 degrees. Vision is a camera that’s attached to our bot and it allows for our robot to see whats going on around it and recognize different shapes, which may be important for our upcoming competition. That’s it for this blog post tonight, see you soon! Welcome back! Our team is working on many things today. The team is working on the swerve drive. The build team is trying to make the swerve drive code better today. Last Sunday we got to test the swerve drive and, let me tell you, it worked great! The programmers did a great job coding it. Another thing our team discusses today was what our team wanted to do with our team shirts. It looks like we are going to be changing it quite a bit, so thats all for today but make sure to tune in for next week’s post. Welcome back to the blog! Today we are working on many things . First off on the behalf of the whole Team 5843, I would like to thank Henshaw for helping us build our brand new pit so we can perform better. Another thing we are working on is our programming. Our lead coders, Matt and Angela are working on the swerve drive code, which is essential in programming so this robot can move. So that does it for today. Make sure you stay tuned to next week’s post. 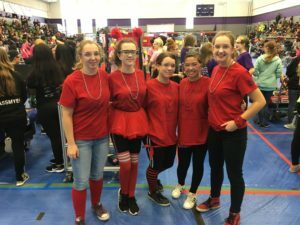 Congratulations to the St. Clair High School’s FIRST Robotics team 5843, Flurb, for playing tough all-day Saturday at the Bloomfield Hills Girls Competition in Bloomfield, Michigan. 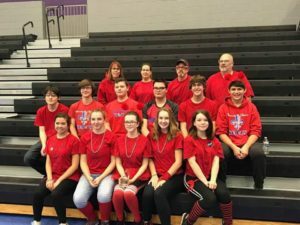 Flurb ended the Qualification Rounds ranked 19th and was selected to join the 2nd seed alliance comprised of the Team 2834 Bionic Black Hawks of Bloomfield Hills, Team 3539 the Byting Bulldogs of Romeo, and Team 3414 the Hackbots of Farmington. The alliance breezed through the quarter and semifinals only to be defeated in the Finals. Way to go Flurb! 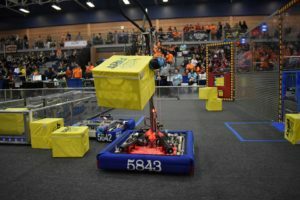 -The St. Clair High School FRC Team 5843, Flurb, is comprised of students from the high schools of East China School District and participates in the FIRST FRC robotics program. For more information about FIRST and the FRC program you can visit their website https://www.firstinspires.org/about/vision-and-mission. Boooo! 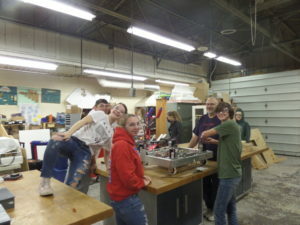 Tomorrow’s spooky day so on this shivery day before Halloween we’ve all crowded in room 312 to work on our robot Nancy. After returning from the girl’s competition two weekends ago, we are reattaching the arm of our robot and working on our swerve chassis. We’re doing many preparations for building season and our next girl’s competition on November 9th and 10th in Bloomfield, MI. Hope to see you there! Please note: This is a posed picture. All safety precautions were in effect during practice. Hello Internet! As a member of Flurb (one of the ones working on the website in fact), I am totally pumped to be posting our first (and hopefully not last) blog post! There is absolutely no content in this post, other than the fact that we are trying to launch this website. If you want to stop reading this, feel free to check out our gallery or facebook page to catch up on the relevant stuff.